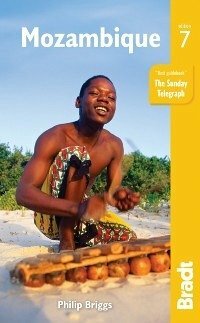 This new seventh edition of Bradt's Mozambique remains the most established and only standalone guide to this alluring country. Complete with in-depth coverage of transport, wildlife, history, culture and accommodation, plus invaluable practical advice and regional and local maps, this honest handbook will help you plan the perfect visit. Particularly useful is the selection of reputable local tour operators. Mozambique is very much a country of two halves. The tourism-savvy south offers palm-lined tropical beaches, luxury lodges and diving to rank with the best in the world, plus the capital Maputo, a city oozing with Afro-Mediterranean flair. The undeveloped northern mainland, by contrast, is one of Africa's last frontiers, with thrillingly vast game reserves and stunning coastal panoramas that draw intrepid travellers to those hankering after barefoot luxury. With economy-boosting oil and natural gas potential on the horizon, Mozambique is on its way to reclaiming its standing as one of Africa's top destinations. However, despite being one of Africa's fastest developing tourist countries, it still offers the opportunity to experience the 'quintessential Africa'. Having once stood in the ranks with South Africa, over twenty years of post-civil war development and one of Africa's highest growth rates are drawing tourists back to its 2,500km of pristine, palm-fringed coastline. Best visited between May and October, Mozambique is dotted north to south with natural, historical, cultural, and architectural wonders remnant of its varied and notable past history of exploration, trade, and cultural fusion. Highlights include the UNESCO world heritage site, Ilha de Moambique, a 16th- century Arab and Portuguese trading post, ancient rock art at Chinhamapere Hill, tea plantations and an exploration of Mount Namuli from the highland mountain town of Guru while the coast - home to more than 2,000 species of marine fish and five of seven endangered sea turtle species - boasts a plethora of delights, from windsurfing in Pemba and surfing in Tofto to diving and snorkelling off the islands of Bazaruto Archipelago (Bazaruto National Park), not to mention some of the richest coral reefs in the world., home to over 1,200 species and five of seven endangered sea turtles.With in-depth coverage and practical advice for all budgets, the Bradt guide leads the way.